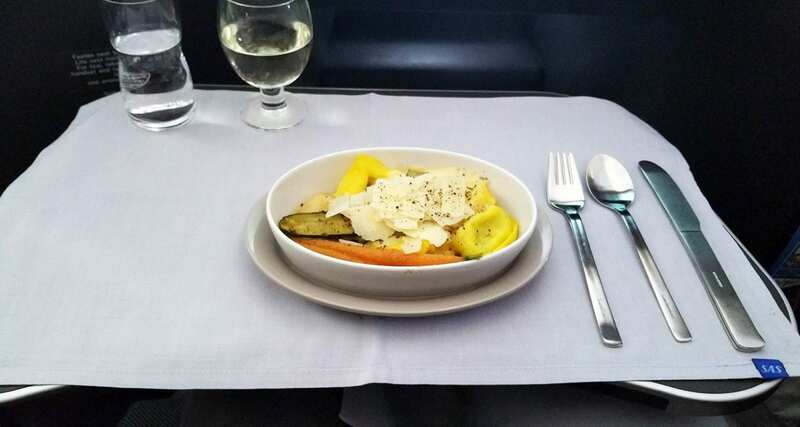 SAS inflight meals review - Business and Premium Economy! 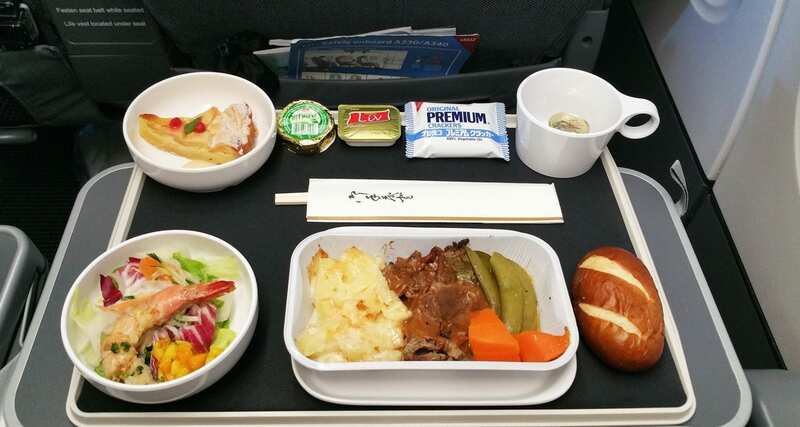 Recently SAS invited a colleague and me to head over to Tokyo to film their inflight meal selection process and interview key staff about how their catering provider in Tokyo create meals for economy, premium economy and business class. 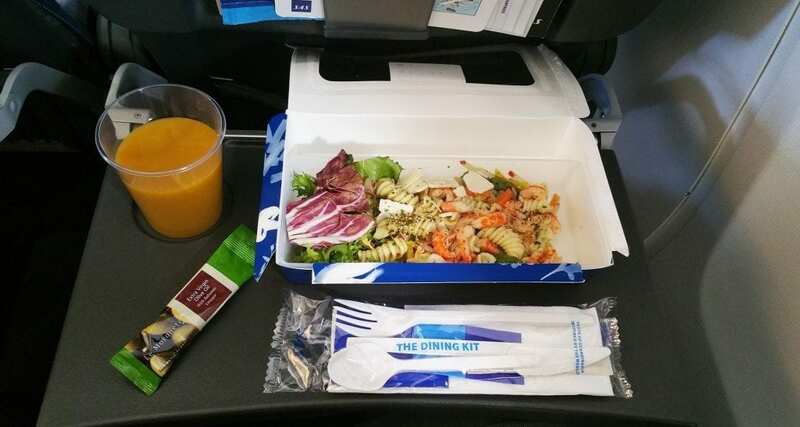 SAS offer free meals on all international flights however depending on what cabin class you are flying will depend on what’s on offer to you. 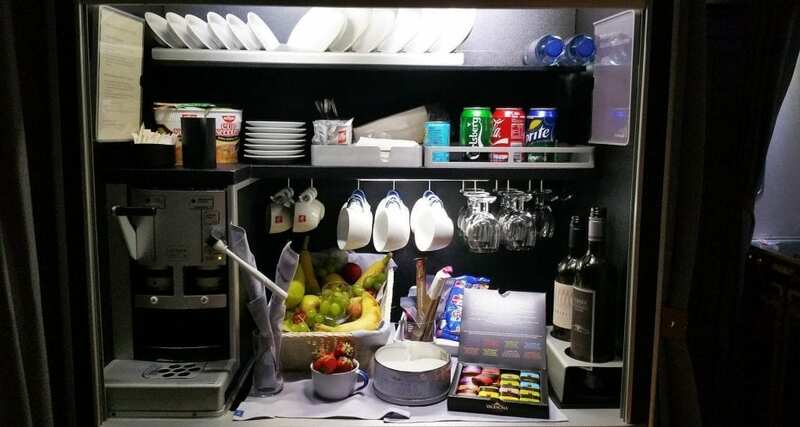 Generally: The SAS Business Class cabin offers a walk-up bar with plenty of snacks, drinks and a real coffee machine, a choice of two entrees and four main courses await you all followed by cheese and three dessert options. Lovely! 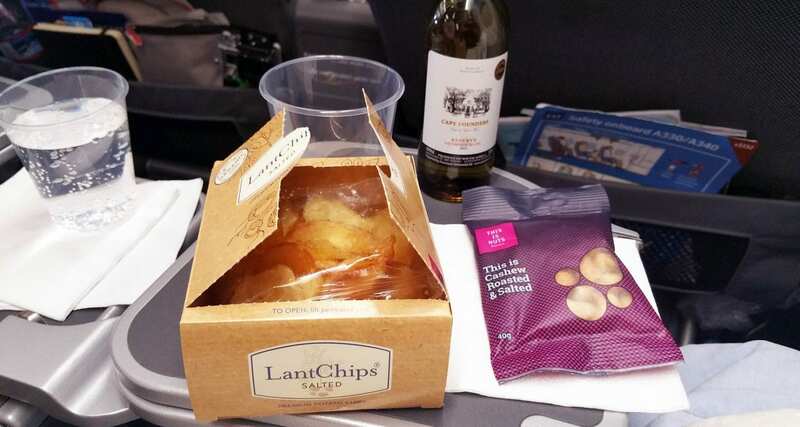 In Premium Economy class passengers can expect two meal choices served on a tray with real china, as well as free-flowing alcohol, a selection of snacks and a second meal before landing. 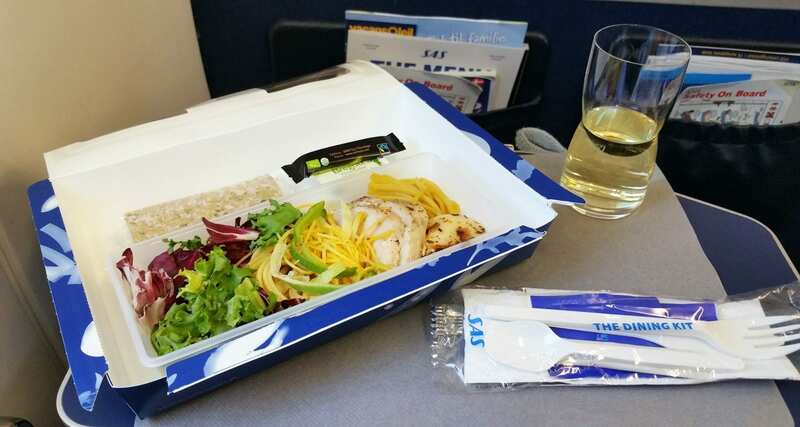 In Economy class, passengers do not receive a meal choice, receive free non-alcoholic drinks and can purchase any alcoholic beverages or snacks if they wish to. On SAS European services there are two distinct service levels, Plus and Go. Tea & Coffee is always free on SAS flights. However, passengers who have purchased a Go class ticket will need to pay for their meals, while Plus passengers will receive free meals and drinks. 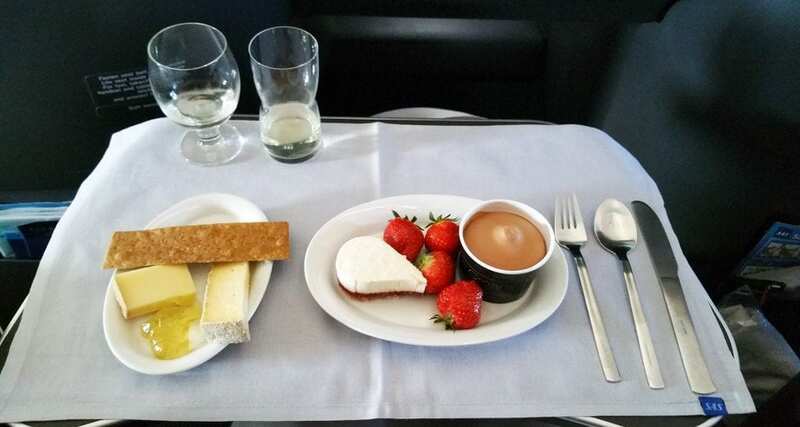 On the return European leg of the journey, I flew from Copenhagen to Dublin in the evening and received the evening meal offering which is slightly more substantial than the lunch offering above. The meal consisted of: Cecina with Blue Cheese and Carrot served with Hot smoked salmon with yuzu roasted celeriac and chervil Hollandaise, and for dessert, a Rhubard tartelette with Granola crumble. Simply delicious! 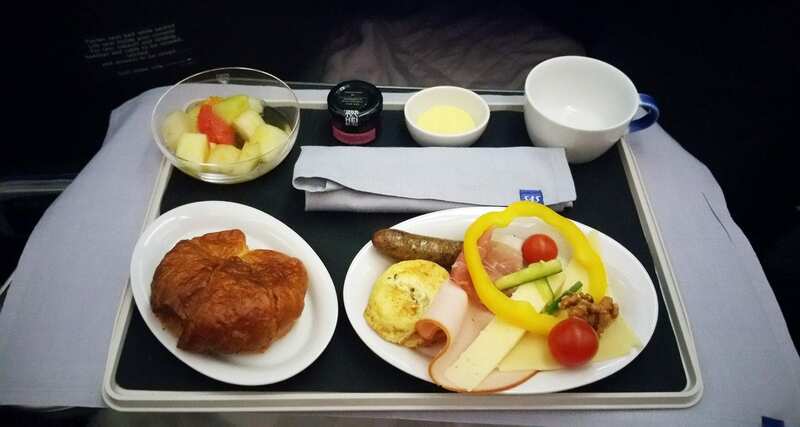 SAS has recently upgraded their cabins, and their long-haul business class is stunning, add to this a restaurant style of inflight service, and you have a recipe for a great flight. Let’s begin! First up the cabin crew ‘dress’ the inflight meal tray with linen, cutlery, oil and glassware, followed by a mixed salad. The two entree choices for today’s’ flight included: Marinated salmon and pickled root vegetable julienne with sweet mustard sauce and liquorice herb or the Chicken ballotine slices with cauliflower puree, sour apples, apple blossom and juniper oil. Again a somewhat fresh, crisp and clean meal offering, just perfect. There was so much choice when it came to the main meal offerings they included: Baked Cod with herb butter, mashed potatoes, cabbage with onions and Hollandaise sauce, or Turkey Breast with parsley potatoes, grilled asparagus and peppercorn sauce, or Veal shank with truffle ravioli, fennel, dried Kalamata olives and plum tomato sauce, and finally Spinach and Ricotta Tortellini with baby carrot, zucchini, and turnip with Parmesan and chive cream sauce. I opted for the Tortellini, and it was delicious. Last but certainly not least was dessert and the offerings included: Raspberry and white chocolate mousse cake, Valrhona Chocolate Ice Cream and the Cheese offering. Unable to decide, the crew quickly decided to plate up all three offerings and who would say no to that? Inflight tip: Ice cream is always a great choice when travelling at 35,000ft as it doesn’t lose it’s flavour like other foods can. Many hours later and just before landing it was time for breakfast, the meals are plated up by the cabin crew as you select what you prefer to eat from their trolley. The offering below is: Fresh fruit served with a croissant and Cucumber, Cherry tomatoes, peppers, Ramson pork sausage, mushroom and herb souffle. One of the most delightful breakfast offerings I have had in business class for a long time! 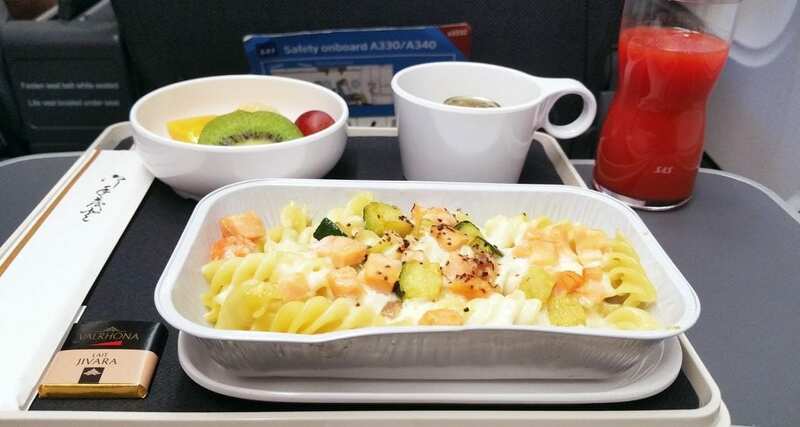 SAS Plus (Premium Economy) is a step up from your standard economy class meal tray; you’ll notice that the airline uses real China for the dessert and salad. The meal was: Beef with potato gratin and vegetables, a prawn salad and apple cake for dessert. 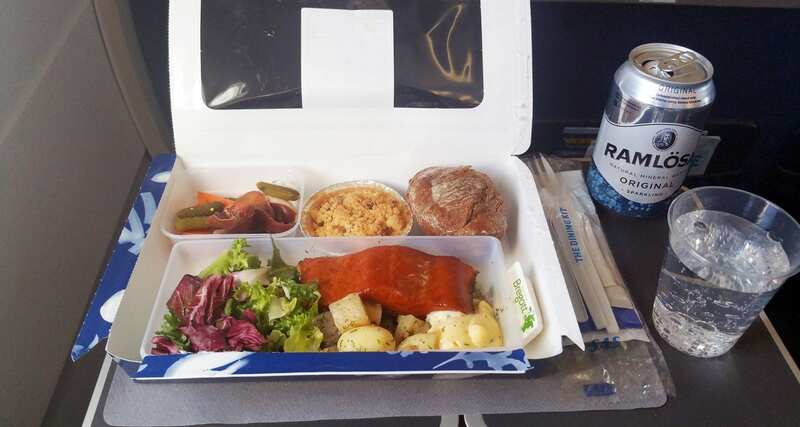 About one hour before landing the crew delivered this smaller meal tray as a second meal service which consisted of Salmon Pasta, a quick and simple meal offering. 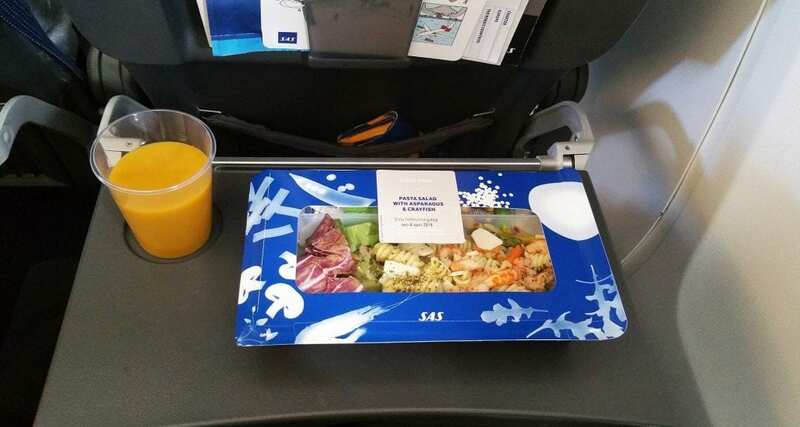 The inflight meal experience on SAS in all cabins was fantastic; I like the Scandinavian touches that the airline gives to each meal where it can. There’s an emphasis on high-quality products in the business class cabin, and premium economy class passengers are not forgotten either. Nice touches also include The Apple Must juice that is cold pressed in West Oslo by the same family since 1661, Coffee by illy, Europe’s first Sake which hails from Grimstad in southern Norway! There’s nothing better than an airline that uses local brands to promote their heritage through the onboard meal experience. For more photos check out the gallery below!